"The Birth of the Sun" was a completely unexpected gift to me and my wife, Catheryn. Shortly after the 12 x 8 foot mural arrived in 1990, we donated it to the University of Pennsylvania Museum. It is mounted on the huge wall in the lobby of the main (Kresse) entrance to the museum. I met Emeteria in person for the first time on a trip to Tepic in Nayarit. I was accompanied by Olga Vasquez who I met through our mutual friend Anne Geary. I immediately fell in love with this Mexican folk art. Olga acquired the paintings from a middleman in Tepic who bought them from the Huichols to sell in his tourist shop. It was only when I met Emeteria in person that I learned the level of exploitation to which the Huichol Indians are subjected. 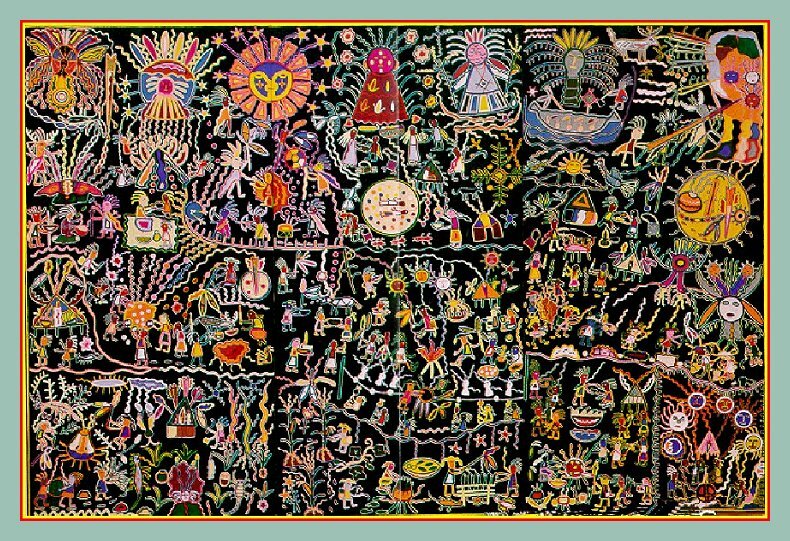 An earlier mural which we commissioned for the opening of ISI in 1979 depicted the religion and myths of the Huichol. While ISI had paid the middleman $10,000, Emeteria had received $500! Hearing this, I told her that, henceforth, she could sell her work directly to ISI. We arranged to send her a monthly stipend of $200 per month so she could create whatever she pleased. We also negotiated separate contracts for her to produce small yarn paintings as souvenirs. We gifted hundreds of them to ISI visitors and clients, varying in size from 16 square inches to four square feet. The money she earned transformed Emeteria's life. Eventually, she acquired a telephone so that we could communicate in real time. Sometimes my conversational Spanish was adequate but on some occasions we used an interpreter to make sure there were no misunderstandings. In March, 1985, Emeteria traveled to the USA. Olga accompanied her, first to California, and then to Philadelphia. At ISI, she spoke to a group of 50 art librarians and taught them how to make their own small yarn paintings. She toured the historic district and visited our nearby Society Hill penthouse apartment. After her return to Mexico, she sent seven matching paintings in honor of my marriage to Catheryn and the birth of our son, Alexander. These paintings reside at the offices of The Scientist in Philadelphia. The two largest, 12 square feet, are dedicated to the bride and groom. The five smaller 2 x 2 foot paintings represent the first five years of a child's life. Emeteria also created a 12 x 8 foot mural dedicated to children, which was originally located at the ISI Caring Center. Later it was moved to the new Caring Center of Philadelphia at 31st and Spring Garden Streets where it remains, dominating the lobby atrium. In 1992, we learned that Emeteria had developed ovarian cancer. Since she was a Shaman, she at first tried self-medication. When that failed, she was treated in Guadalajara. The cancer went into remission, but six months later the symptoms re-appeared. Emeteria died in 1994 at the age of 42, leaving ten children. 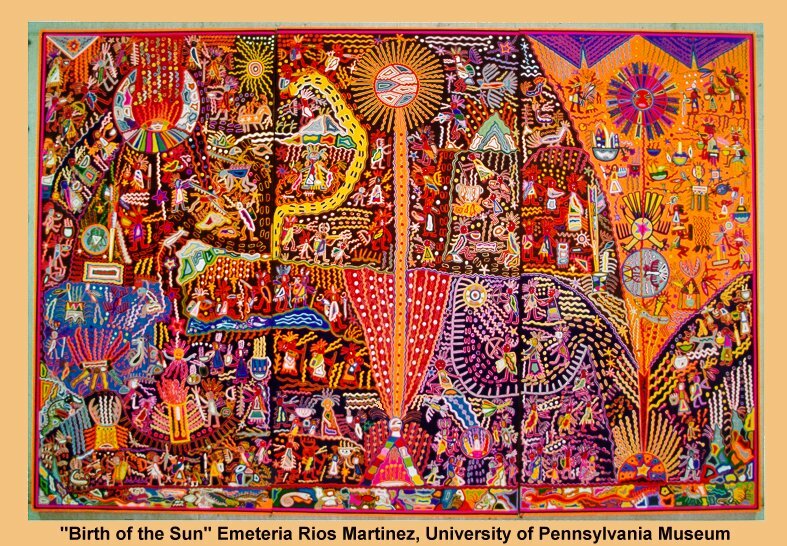 Over a period of two decades, Emeteria Rios Martinez (Kapuri) evolved from a talented artist who became transformed into a mature muralist and gave the world an enduring and colorful legacy depicting the life and culture of her people. 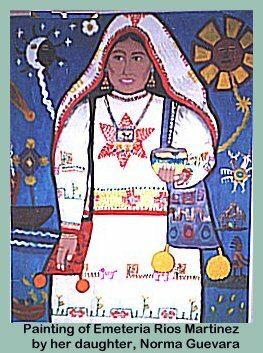 Her Huichol name, Kapuri, meaning white and sensitive flower, well expressed her character.